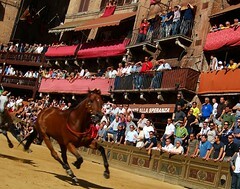 Ah, the Palio of Siena. One of my favorite travel stories of Italian adventure, intrigue and group sports hysteria. Though there was the soccer match last summer between St Pauli and Trinidad & Tobago. I’m pleased to report that my friend Austin Kelley (The Modern Spectator) has just published a great article on the Palio race in Men’s Vogue. You really ought to check it out. And go to Siena, before you’re too old to think twice about standing on the racetrack in a passionate crowd of thousands, as jockeys get thrown and wild-eyed horses crash past just inches away.